featuring artists: Gina Dawson, Rob de Oude, Enrico Gomez, Carl Gunhouse, Reid Hitt, James Isherwood, Peter Lapsley, Tom Marquet, Chris McGee, Keri Oldham, Lauren Portada, Christine Rogers, Elisa Velazquez. Camel Art Space is an Artist Operated exhibition space and collective established to create opportunities for artists and curators. Started in 2009, Camel Art Space has become a bedrock for emerging artists in the East Williamsburg and Brooklyn community. An artist studio facility, exhibition space and collective rolled into one, Camel Art Space presents 10 plus exhibitions a year curated by its members, independent artists and outside curators. A primer space for experimental work, Camel has become renowned for its abundance of artists and exhibitions centered on contemporary curatorial practice. 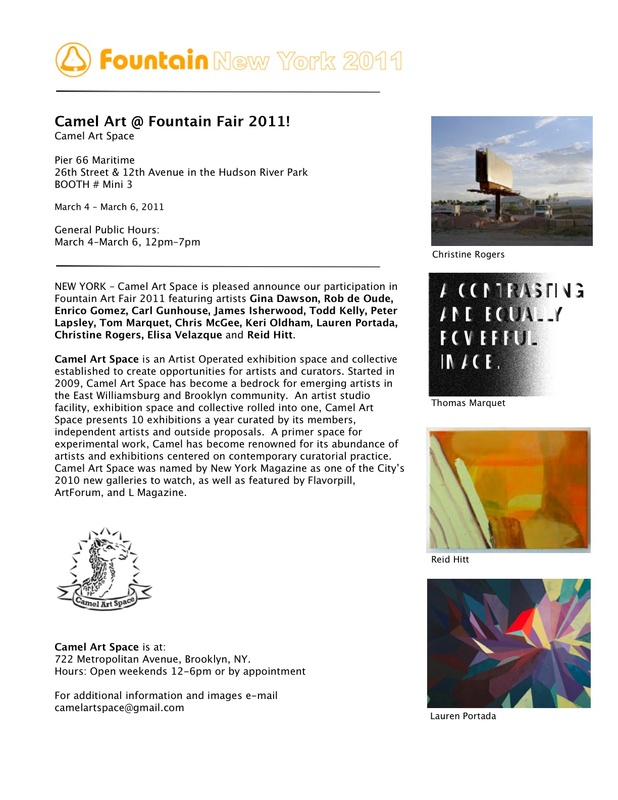 Camel Art Space was named by New York Magazine as one of the City’s 2010 new galleries to watch, as well as featured by Flavorpill, ArtForum, and L Magazine. 722 Metropolitan Avenue, Brooklyn, NY.